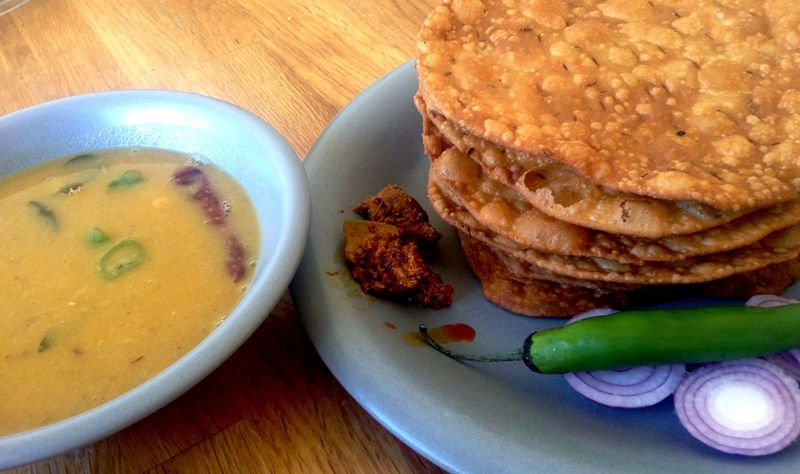 Dal- Pakwaan is basically a Sindhi dish and is made in Sindhi homes too often. 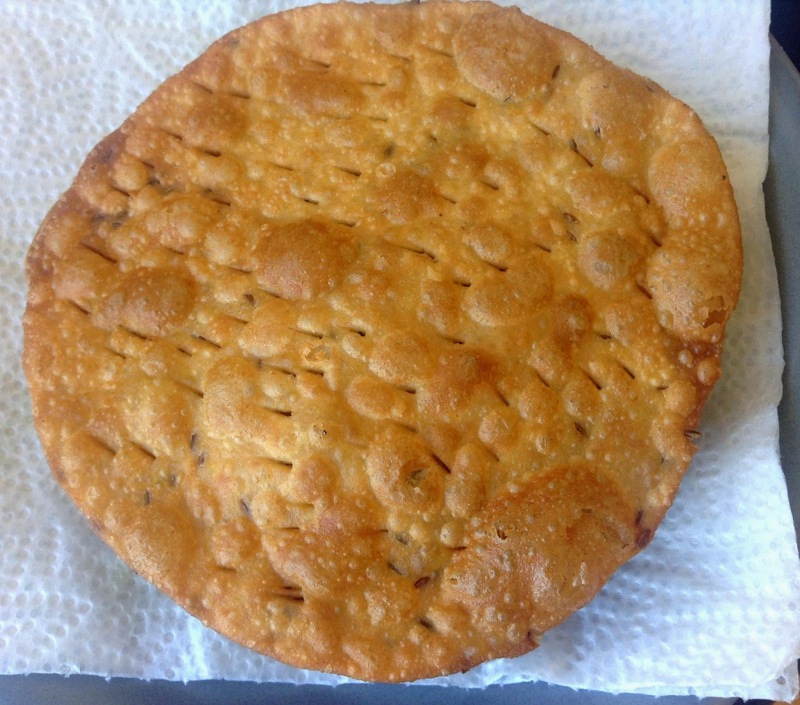 Me being a punjabi, have never had it at home; but have had it at roadsides in India. And it tasted simply superb.. !! I recently decided to try for myself this dish, and it came out wonderful for a Sunday morning heavy breakfast. Basically, Chana Dal is used in this recipe; but the procedure is completely different from the Punjabi style Chana Dal. 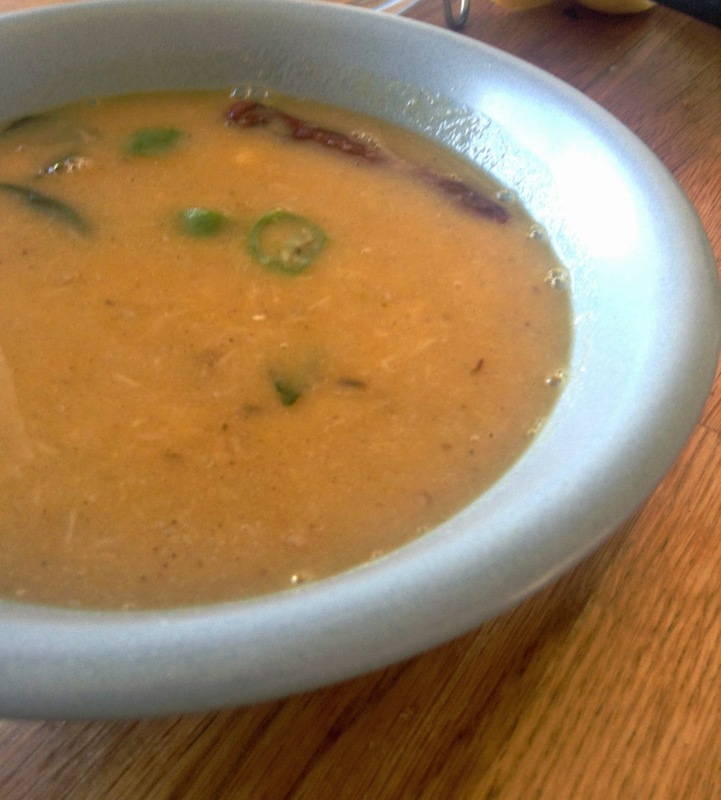 I call it "pakwaan wali dal" as the recipe is very different and simple; and probably I could not savour it with anything other than pakwaan. So here we make Dal -Pakwaan. First I write the recipe for dal, and then for the pakwaan. Soak the chana dal in water for 3-4 hours so it becomes little soft. Then boil it with 3 cups water till 5-6 whistels (depending upon the cooker). Open the lid and add salt, red chilli powder, coriander powder and garam masala in the dal. Mix well and let it simmer for 10-15 minutes so the masalas blend in completely. Heat oil and crackle mustard seeds. Add the asafoetida, curry leaves, green chillis and dried red chilli. Fry for 2 minutes and add to the dal. Mix well and cook for another 2-3 minutes. Turn off the heat and cover for 10 minutes. Open lid and serve hot with pakwaan. Mix salt and cumin seeds to wheat flour. Add little oil. Mix well with fingers till it gets to crumbling consistency. Make dough by adding very little water, a spoon at a time; this will make hard dough, like the dough you make for Wheat Papdi or Wheat Namak pare etc. Keep aside for 15 minutes. After 15 minutes, pinch little balls from the dough and make rounds. Flatten them with the help of a rolling pin, just like you would do for puffed poori, but double the size. Prick all of them with fork/knife so that they don't puff up like pooris. Deep fry each one into the oil on medium flame till they become crispy and golden brown on both sides. 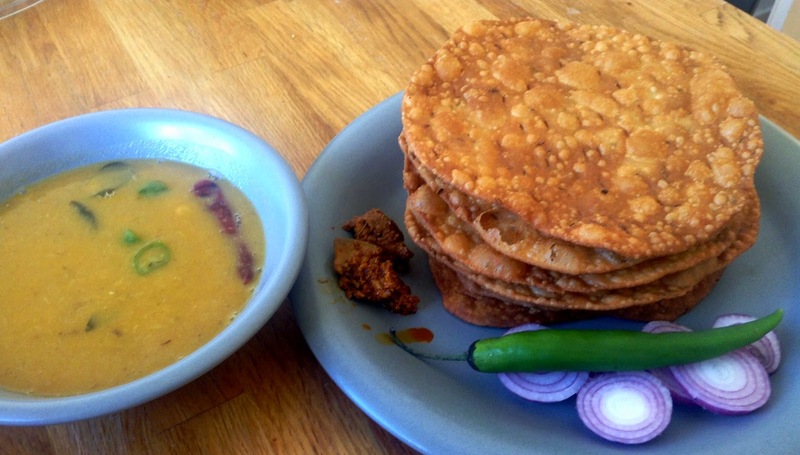 Drain on a kitchen paper and serve with hot dal, some pickle and onion-green chilli salad. 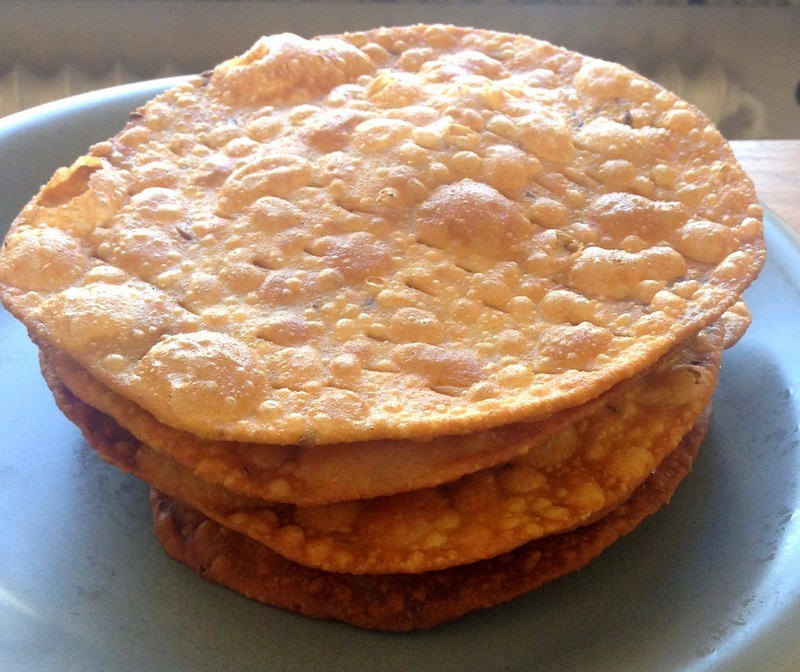 Just a quick question can we bake the pakwaan instead of deep frying it? My pakwaan never turns out to be crispy.. I tried making with apf too.. I knead d dough hard and even prick the pakwaan with fork still it never cones out perfect..